Wow Pat, a stunning image. Yea, I love the camera orientation on this. I think it works just as well without the sky too. An excellent image. Wonderful birds-eye view of these little darlings. Happy Holidays! I wound not have thought going verticle. It works! I like the shot! Interesting composition! Beautiful shot of this bird. 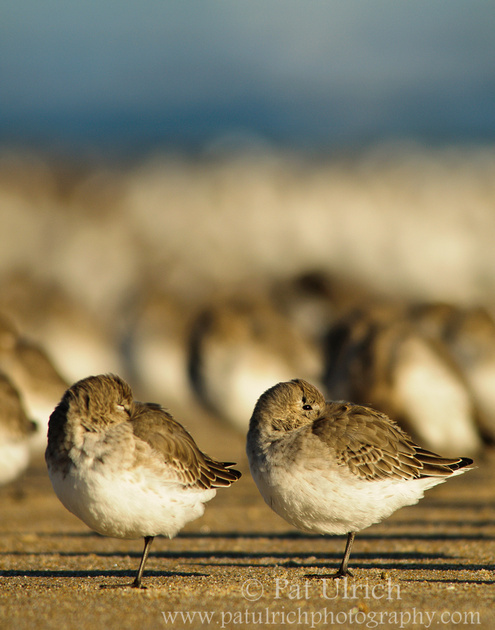 I still seem to struggle with picking dunlins out of a crowd of shorebirds. Great photo and thanks for the suggestions about camera orientation. That's something I can try out next time. Super image Pat! that composition and those colors are fabulous! Gorgeous Pat. It's like its more about the shapes and textures that form the composition than the birds themselves. Extrordinary view! Happy Holidays to a Modern Master! That is a beautiful composition!